I’ve been back from observing at Arecibo for a bit now, but I thought I would summarize the observing experience. Mostly, observing at Arecibo isn’t much different from observing remotely in Ithaca. The biggest difference in terms of running the observations is that I get many more monitors to watch, as you can see in the pictures below. 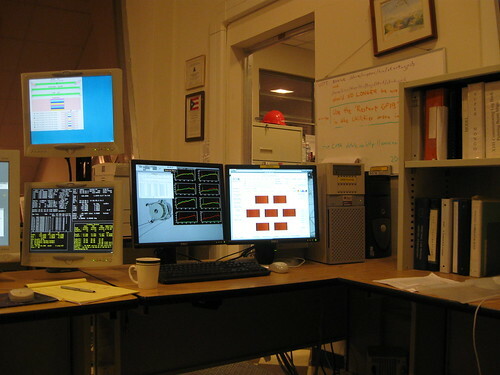 When observing in Ithaca, I have two monitors (running with one computer) for everything – one to display the program that controls the telescope and one for data monitoring. At Arecibo I have two computers, one with six monitors (telescope and observations control) and one with two (data monitoring). The set-up with all the monitors is very nice, especially because a lot of programs that monitor the status of the telescope and system set-up are displayed (the four peripheral monitors). Occasionally though, the different set-up would cause me to have a mild panic. I would glance at the data monitoring, for example, and then become uneasy when I didn’t see the program controlling the observations and telescope out of the corner of my eye. I managed to keep forgetting that it was on another set of monitors, a few feet away. All that extra monitor space could be disturbing at times. 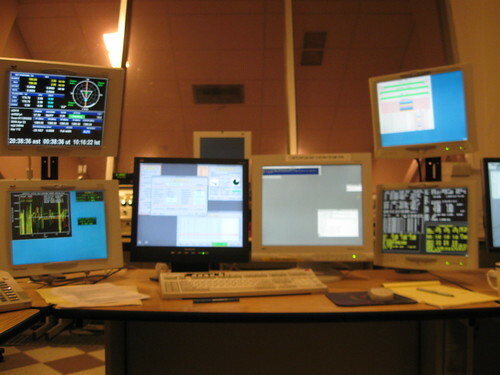 The computer, and all its monitors, used to control the telescope. The computer for monitoring data quality. While the observing set-up is nicer at Arecibo and slightly more responsive since there’s no remote connection delay, that’s not the motivation for traveling all that way. The real reason to travel to Arecibo is to interact with people. Now, there are lots of people to meet at the observatory, but, in terms of observing, it was great to finally meet the telescope operators. The telescope operators are there to help make science observations run as smoothly as possible, which means they help with telescope set-up and are the first people you turn to for help when troubleshooting. When observing remotely, I would call the operator about fifteen minutes before the start of our observations to let him know that I was ready to take control of the telescope and to request the telescope be slewed to our desired position. What this means is that the extent of my interaction with the operators had been occasional 30-60 second phone conversations and snippets of dialog through a chat window in the telescope control program. One of the most productive parts of my trip was having the opportunity to meet the telescope operators in person and chat with them (especially during the long nights). It wasn’t just that it was nice to be able to put faces to the names of the operators I had worked with remotely; having interacted with the operators more has left me more confident of dealing with observing troubles remotely. Now, if I have to call the operator because of troubles (WAPP failures, network failures, etc. ), it’s not calling a stranger and explaining the situation from scratch. Instead, I know the operators and they know me, and we can jump right into solving the problem and starting observations as soon as possible.